The Pantomime season is upon us. 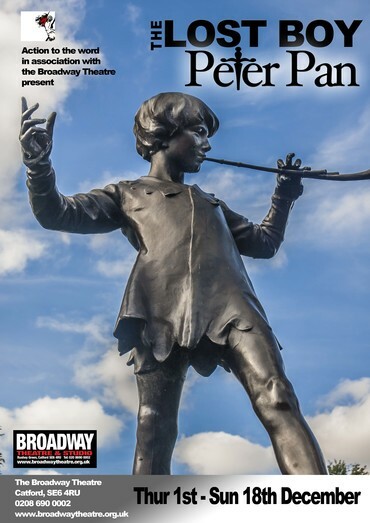 At Greenwich Theatre, Peter Pan: A New Adventure by Andrew Pollard opened last week, and Peter Pan is also to be found at the Broadway Theatre in Catford this Christmas with The Lost Boy Peter Pan (not technically a pantomime): 'The Broadway’s Resident Theatre Company, the award-winning ACTION TO THE WORD bring their brand new twist on J M Barrie’s classic novel to stage this Christmas. With live music, singing and interactive theatre for children of all ages, this alternative to traditional Pantomime is the perfect treat'. 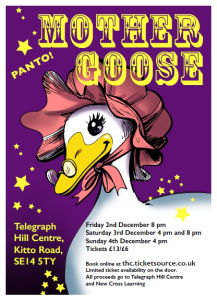 This year's Telegraph Hill Centre community panto is Mother Goose: 'Mother Goose rents her Brockley hovel from money-grabbing Squire Hatcham. Poor Mother Goose. She’s not young, good looking or well off. But Mother Goose is kind, loyal and a dedicated community activist. Oh yes, she is!' Most shows next weekend are sold out, but still a few tickets left for the Friday. Pantomime has a long association with South London, the phrase 'Transpontine pantomime' being used in the 19th century to refer to the shows on the Surrey side (i.e South side) of the Thames, in venues such as the Surrey Theatre in Blackfriars Road and the Vic at Waterloo. An 1867 article entitled 'THE TRANSPONTINE PANTOMIMES' noted that these theatres had become the main venues for Christmas panto: 'In the internecine war raging between pantomime and burlesque, the latter has decidedly the best of it this Christmas in the centre of London. Out of the dozen theatres in the heart of the metropolis, only two, Covent Garden and Drury Lane, have produced pantomimes. In the outlying districts, this time-honoured species of winter amusement is in full force, and notably in the three theatres on the Surrey side of the Thames—Astley's, the Surrey, and the Victoria' (Cheltenham Chronicle, 15 January 1867). So familiar was the formula that the phrase 'transpontine pantomime' passed into the language as a metaphor for absurd and knockabout events. So a parade of Chinese soldiers in 1894 was described as thus: 'their drill and demeanour, were suggestive of a show of a transpontine pantomime. (Western Times, 31 October 1894). Similarly the humiliation of the Ashanti king during the British occupation of what is now Ghana was decribed as 'A scene more fit for a transpontine pantomime than one de-signed to impress a conquered foe with the idea of European dignity or British magnanimity' (Daily Gazette for Middlesbrough, 24 January 1896).